My primary research interests are analytic number theory and representation theory. More specifically, I work on problems in automorphic forms and representations of algebraic groups, and their generalizations on arithmetic covering groups. This work is supported by NSF Grant DMS-1801527. Below is a list of recent publications and preprints. Collaborative work with Dan Bump, including many supporting materials on multiple Dirichlet series, can also be found in the Papers section of his home page. His page contains some additional supporting materials, mostly for our older papers from the "aughts," so you might want to try there first. Eisenstein Series, Crystals, and Ice (expository paper with D. Bump and S. Friedberg), Notices of AMS 58 (2011), no. 11, 1563--1571. Schur polynomials and the Yang-Baxter equation (with D. Bump and S. Friedberg), Comm. Math. Phys. 308 (2011), no. 2, 281--301. Weyl group multiple Dirichlet series of Type C (with J. Beineke and S. Frechette), Pacific J. Math. 254 (2011), no. 1, 11--46. Weyl group multiple Dirichlet series: Type A combinatorial theory (with D. Bump and S. Friedberg) -- Preliminary Version. Book available as: Annals of Math. Studies v. 175, Princeton Univ. Press (2011). Gauss sum combinatorics and metaplectic Eisenstein series (with D. Bump and S. Friedberg), In ''Automorphic forms and L-functions I. Global Aspects,'' Contemporary Mathematics v. 488 (2009) 61--82. Twisted Weyl group multiple Dirichlet series: the stable twisted case (with D. Bump and S. Friedberg), Eisenstein series and applications 1--26. Progr. Math., 258, Birkhauser. Analytic Continuation for Cubic Multiple Dirichlet Series, Ph.D. Thesis, Brown University (2003). Nathan Gray, graduated May 2017 (ice models and statistical mechanics on the metaplectic group). First job:visiting instructor at Mount Holyoke College. Mario DeFranco, (visiting professor at MIT, 2014-2015), worked on projects in p-adic representation theory related to the Bessel functional. Defended thesis in April, 2014. Sawyer Tabony, (visiting assistant professor at Boston College, graduated May, 2011) wrote a thesis on symmetric function theory from lattice models in statistical mechanics and Hecke algebra computations for the metaplectic group. Principal series representations of metaplectic groups over local fields, a nice presentation of results for general metaplectic covers. Bob Hough, Stanford Class of '07, wrote a comprehensive Summer Research Journal on Gauss sums, culling from Ireland and Rosen; Berndt, Evans, and Williams; and papers of Weil, Yamamoto, etc. with some original synthesis. 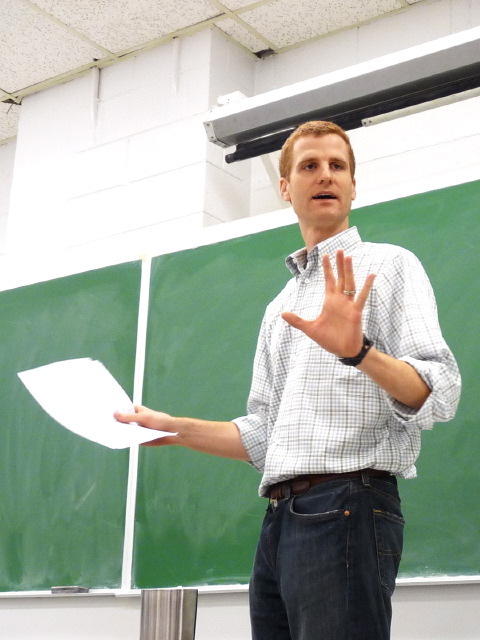 Carl Erickson, Stanford Class of '07, has been working on behavior of the Riemann Zeta Function in the critical strip. The resulting article appeared in the Stanford Undergraduate Research Journal and can be found in the Spring 2005, Issue 4 of SURJ. For Spring '17, I am teaching Math 3283W, "Sequences, Series, and Foundations," which serves as both a first course in elementary analysis and an introduction to mathematical proofs. During Fall '16, I taught Math 8300, a graduate topics course on Iwahori-Hecke algebras. In Spring '16, I taught Math 3593H, integral calculus on manifolds using linear algebra, from the book of Hubbard and Hubbard. In Fall '15, I am taught an undergraduate honors course, Math 3592H using the book of Hubbard and Hubbard. Lecture notes will be posted there throughout the semester. The course will continue in Spring 2016. For Fall '14, I taught a graduate course in algebraic number theory, Math 8251, using Neukirch's book. Lecture notes, which just expand on and rework the book, are available at 8251 lecture notes. In Spring '14, I taught a second-semester graduate course in complex analysis focusing on the Riemmann mapping theorem and Riemann surfaces, Math 8702. Scans of lecture notes I gave are linked there (culled from Ahlfors, Miranda, and Donaldson's books). For Fall '13 and Fall '12, I've been teaching an introductory graduate course in complex analysis, Math 8701. For Spring '13, I was on leave as an organizer of a special semester program at Brown's new NSF-sponsored institute ICERM. For Fall '11, I'm teaching 18.03 -- Differential Equations. During the '10-'11 academic year, I taught a seminar on additive number theory from Nathanson's books and a graduate course in automorphic forms (1/2 classical, 1/2 analytic aspects from Borel's book). I tried to write detailed course notes -- some of which are little more than recasting of notes of Milne, or Shimura's book, or Borel's book. They are available here: 18.785 notes. During the '09-'10 academic year, once again I taught 18.01, first-year calculus and was on Junior Leave in Spring '10. For Spring '09, I taught 18.786: Topics in Algebraic Number Theory on "Tate's Thesis," closely following the books of Ramakrishnan-Valenza ("Fourier Analysis on Number Fields" -- the actual name for Tate's thesis) and the classic Weil's "Basic Number Theory." There was no course website. During Spring '08, I taught 18.784: The Mathematical Legacy of Ramanujan, a small seminar course. I hope to eventually put up students' final projects, which were outstanding and original. For Fall, '07, I taught 18.781: Theory of Numbers, a first course in number theory using Niven, Zuckerman, and Montgomery, but also featuring special topics like cubic reciprocity based on the treatment in Ireland and Rosen's book. During Spring '07, I taught 18.103: Fourier Analysis - Theory and Applications. This course covers Lebesgue measure and integration theory and Fourier analysis, using the book by Adams and Guillemin. We'll discuss applications to probability along the way, and if time permits, how both the probability and the Fourier analysis are used in modern analytic number theory. For Fall '06, I taught 18.786: Topics in Algebraic Number Theory on "Reciprocity Laws." Math 110: Applied Number Theory, a course on cryptography using number theory, field theory, and elliptic curves. Math 109: Applied Group Theory, an introduction to group theory focusing on groups as measures of symmetry. Math 263A: Lie Groups (course announcement here), an introductory course for graduate students. For the Fall quarter, 2004, I taught Math 52: Integral Calculus of Several Variables, a course on integration techniques culminating in the theorems of Stokes, Gauss, and Green. During Spring quarter, 2004, I was on leave. Math 248B: Algebraic Number Theory, covering basic introduction to automorphic L-functions. During Fall quarter, 2003, I taught also Math 51: Linear Algebra and Differential Calculus of Several Variables. Click on the link for the web page. MIT number theory seminar, organized by Bjorn Poonen. TUESDAYS 4:30-5:30 in 2-139 (when there's no BC-MIT seminar). Last change: September 4, 2015.